This piano and SATB arrangement of “Where He Is Now” from Dr. R.C. Sproul’s new sacred music project, Saints of Zion, offers biblical truth through beautiful choral arrangements by composer Jeff Lippencott. This project provides hymns to enrich the worship of the people of God and bring glory to our Creator. 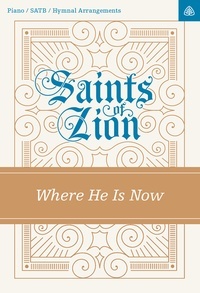 Browse all of the available sheet music from Saints of Zion. By purchasing digital print licensing, you agree to the Terms & Conditions. Digital print licensing is not transferrable. If you need additional licenses, you may purchase a combination of print licenses to meet your needs. For more details, explore the Frequently Asked Questions. All sales are final.